A new ARPA-E startup is developing a battery improvement with a target price of $0.17 per watt-hour. I imagine that this price reflects current market prices for materials and so it might not reflect a revised demand scenario as we try to build large scale grid energy storage. However, if lithium batteries can be developed for this price, it seems likely that liquid magnesium (target price $0.05 per watt-hour), iron air (target price $0.10 per watt-hour) or some other advanced battery can get to a similar price point. Why is this important? Because at current prices (~$1/watt peak capacity) solar panels are already the cheapest power when the sun is shining. The problem is that the sun doesn’t shine on the solar farm all day. So let’s say you could save that power and sell it later. We want to deliver a continuous flow of power from a panel that only gets 6 hours of sun per day. This works out to a need for ~4.5 wH of storage for every watt of peak panel capacity. I started off with the assumption of panels at a price of ~$1/watt peak capacity (that’s conservative). 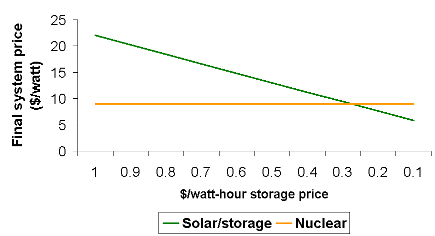 Based on this number, I worked out the total panel+battery cost (per 24 hour watt) as a function of storage cost. At about $0.25 per watt-hour, batteries and solar panels can be manufactured on a watt-for-watt price equal to that of new nuclear plants. In principle, they can have similar capacity factors. The bottom line is that inexpensive grid storage can keep the lights on. It doesn’t solve transportation fuel problems or land-use issues, but it means industrial civilization can exist with business-as-usual technology and economy for a very long time. This entry was posted in Uncategorized and tagged electricity, energy, grid, storage on October 27, 2012 by Peter.